Despite the romance in its name, many folk just pass through Mandalay, stopping off to see the Mahamuni Paya temple with its ancient 13foot tall Buddha on their way. But it's certainly worth stopping for a while to look behind the modern zones and see the strange collection of mosques, temples, churches and pagodas and the countless monasteries lining the riverside. Many of the best places to stay in Mandalay are tucked away behind drab concrete towers, but don't be afraid to look behind them and you'll find all sorts of wonders. The old moat and fortress walls are an impressive reminder of the former Mandalay fortress. Only viewable from the outside, the walls are punctuated at intervals by gate towers with intricate wooden topped carvings. Admire the spectacular Mandalay palace with its tall watch tower providing great views for visitors looking out. The wonderful carved panels of the monastery of Shwenandaw Kyaung. The monastery is especially historic as it is the only remaining major structure of the original Royal Palace. Kyauktawgyi Paya and the 26ft tall Buddha weighing a huge 900-tonnes. Carved from a single block of marble and dressed in royal attire - this statue is unmissable. Experience a working jade market and witness locals plying their trade at the market. The stones are beautiful and come in all shapes, sizes and colours and there are various food stalls as well. The Hotel Guru's selection of the best places to stay in Mandalay allows guests to enjoy a relaxing gem in the heart of the city after a busy day of exploring. 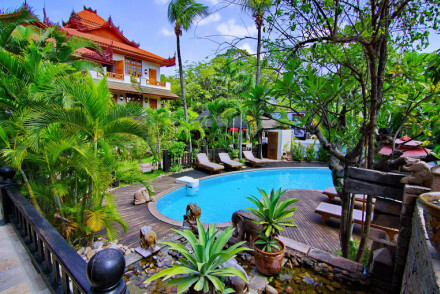 The Hotel by the Red Canal is a 26 room boutique hotel tucked away down a backstreet just 15minutes drive from Mandalay Hill and the city centre. The main building is reminiscent of a Burmese monastery and there is a cavern-like underground spa. It has all the mod. cons. and more, like iPod docks and flat-screen TVs and black marble bathrooms. If you'd prefer your own space, don't hesitate to visit our online partner Booking.com for a range of properties to suit visitors of all needs. Fly to Mandalay International Airport located 37km (23 miles) from Mandalay. The airport serves multiple domestic and International destinations. Alternatively, catch a train to Mandalay with rail links to various destinations including Yangon. There's also ferry services to Bagan. If you want to rent a car, for prices visit our online partner Rentalcars. Best time to visit - October to March typically provides the driest weather with warm temperatures. Alternatively, widen the net and see our recommendations in Yangon or Taunggyi. A tropical oasis in the heart of the city of Mandalay. Indulgent, secluded and packed full of charm.